We are one of the Leading Manufacturer and Supplier and Importer ofWater Bottle like Copper Water Bottle, Satinless SteelWater Bottle and AluminiumWater Bottle. 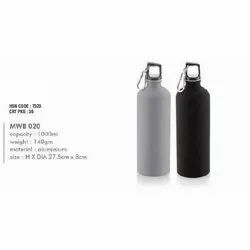 • Copper Coating For Better Heat Retention Milton Insulated Steel Bottles Are A Part Of The Thermosteel Range. Its Unique Temperature Retention Mechanism Keeps. It Will Keep Your Drinks Just The Way You Need Them Through Out The Day. Vacuum technology enables to keep liquid hot/cold for longer duration. They are designed to be lightweight, making them great for long hikes, long trekking, days on the beach, hot yoga class, golf, long load trip or everyday office use. Suitable for Kids and Adults. wide mouth permits easy cleaning. Wide drip-free mouth opening for ice cube insertion and easy drinking. Perfect for hiking, camping, sports and everyday use. 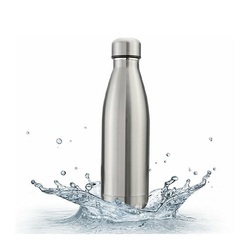 HIGH QUALITY STAINLESS STEEL MATTE FINISH WATER BOTTLE Whether you are outside playing a sport, at school or inside at work all day, you have got to stay hydrated. 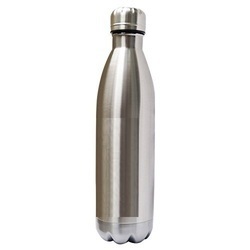 Bottled water is expensive and quickly turns warm and unpalatable, so ditch it for a reusable, Steel bottle.. Made from food-grade Stainless steel, this bottle is 100% BPA and Phthalate free, so you can feel comfortable using it time and time again, and sending it to school with your little ones. The stainless steel material repels lingering flavors, so whether you prefer water, milk or juice, your beverage will taste exactly as it should. The slim design fits into most standard auto cup holders, making it perfect for long car rides and commutes. Swap out wasteful, warm bottled water for a longer-lasting, better quality solution, and enjoy delicious drink out of a water bottle.